This site-specific installation contemplates the future of Charlotte's First Ward, a section of the city that is slated for drastic revitalization and development. 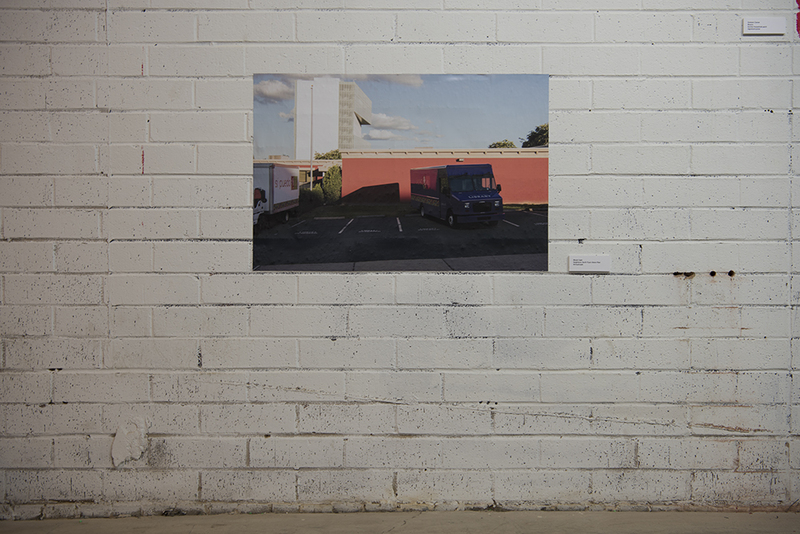 Installed in the Goodyear Arts College Street location, which is marked for demolition as part of the Charlotte's North Tryon Vision Plan, the installation consists of two photographs on vinyl that provide a view through the wall of the building. The photographs contemplate the impending demolition of the neighborhood by witnessing what currently stands. The photographs were shot at 7:00pm four days before the exhibition's reception to approximate what the vista would look like during the event. In addition, the vinyl was hung at the exact height the image was made at. This takes into account the elevation of the building with respect to the adjacent parking lots. These two images act as documents, treating the depicted landscapes as having been previously demolished. When, in fact, they could be seen in real time from the building's parking lot.